Mastertech Environmental Responds Quickly to provide Discreet and Professional cleanup for the following services. The aftermath of a violent crime or emotionally traumatic event can be overwhelming for those left behind. Emergency and law enforcement personnel deal with immediate concerns like necessary medical treatment or evidence preservation, but the task of cleanup often falls upon the shoulders of friends, family members, business owners, and property managers. Without taking time to grieve and recover from the trauma, they must erase all evidence of what has happened. Along with emotional hardship, crime scene and trauma cleanup present special environmental challenges. Biological residue, dangerous chemicals, deadly pathogens and other contaminants may be present, and may require specialized retrieval and disposal techniques. A surface cleaning may overlook unseen body fluids which, if left undetected, could cause infection or spread disease. Special permits may be necessary to transport and dispose of hazardous biological wastes. How quickly can your company arrive? We are a 24 hour service, so professional cleaners may be dispatched to your location immediately after receiving the call. Mastertech understands that true 24 hour service means complete accessibility. Our operators stand by at all hours of the day and night, often times answering the phone on the first ring. Our technicians are located throughout Eastern Pennsylvania and will respond directly from their homes to your property. Should you be prompted at any time to leave a message, your call will be immediately returned. How long does unattended death, trauma or crime scene clean-up take? The length of time it takes to perform crime scene or unattended death cleanup will vary. However, our technicians work through the night to remedy the situation and allow the family or property owner to regain access. We work as quickly as we can while still being extremely thorough in our death scene cleanup efforts. Once the property has been treated for all hazards and is certifiably safe, the crime scene clean-up process is put in motion. This may include painting, drywall replacement, carpet replacement, sub-floor replacement, and many other services. Mastertech will work quickly and carefully to return your property to pre-incident condition. Most restoration efforts can be completed within one day however, in order to properly match up carpeting or flooring, additional time may be necessary to match the correct style and grade of the existing floor. Who typically pays for Mastertech’s cleanup services? In most cases, home or property insurance companies will pay the claim for our cleanup services. When coverage is awarded, it is usually under a homeowner’s policy that is not considered to be a “named-perils policy”. Named perils policies usually only covers fire, lightning, windstorms and hail, explosions, riots/civil unrest, smoke damage, aircraft and vehicles, vandalism, theft, falling objects, water damage, and snow weight. These policies are not as common as typical homeowner’s policies. In the event that Mastertech’s cleanup services are not covered by named perils policies or others, we will provide a quote directly to the property owner. Why shouldn't I do the clean up myself? Employee exposure to hazards that can cause numerous diseases and medical conditions. Among these are Critical Incident Stress Syndrome and Secondary Traumatic Stress Disorder. Exposure can result in workers compensation claims and other liabilities. State and Federal mandates have been established regulating the collection, handling, and disposal of human bio-hazardous waste. Companies can face serious penalties for not adhering to these regulations. Personnel conducting hazardous water collection and disposal are required to follow specific training and medical mandates set by state and federal agencies. Failure to comply can result in serious penalties. Safely and efficiently restoring property to its pre-incident condition, Mastertech relieves the burden of family, friends and those closest to the situation. 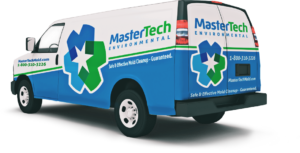 Mastertech Environmental has the necessary certifications, permits, equipment and qualified staff to safely address the cleanup of any traumatic or hazardous situation, wherever it may occur: inside or outside, in vehicles, residences, or commercial properties. Trained and experienced in the handling of blood-borne pathogens, our technicians utilize personal protection gear to extract and properly dispose of biohazards and dangerous chemicals. Mastertech is available for 24/7 emergency response. At Mastertech, we are sensitive to the concerns and emotions of those who may be present at the cleanup scene. They may have questions or fears, or may simply need a sympathetic smile and comforting word. Our staff understands the shock and grief they are feeling, and responds with respect, discretion and genuine concern. Easing both the physical and the psychological burden of tragedy and trauma cleanup, we are proud to partner with home and business owners in need of compassionate, skilled property restoration. Cleanup after a bio-hazard contamination can be extremely stressful. Do not face it alone. We can help.